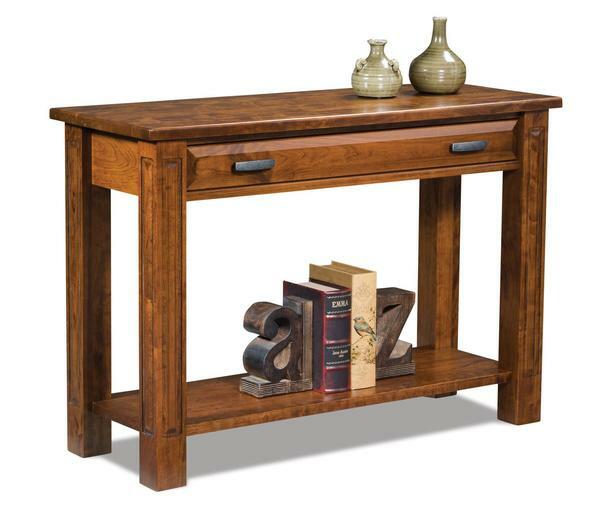 Our Amish Lexington Open Sofa Table with Drawer is a traditional style accent table with strong features. A one-inch thick boat-shaped top starts out the design supported by four legs with deep insets and an open shelf. The fully-extending drawer is accentuated by bevels. Shown in sap cherry with vintage antique stain, customize this living room occasional table by choosing from a variety of wood types, finishes, and hardware.